Made from leather, canvas, and art. There are two types of people: those who follow their own path and those who hitchhike on another man's highway. The Pad & Quill Briefcase is a laptop bag for the former, the dreamers and the visionaries. The world is changing, and with it so are the needs of a modern business briefcase. Some need an iPad Pro bag to run their business, while others stick to the classic pen and paper. Honoring the past while embracing the future, our Small Briefcase is built from robust water resistant 24-oz waxed canvas body with full-grain water repellent leather overlay, and held together with hardware and stitching that will last well beyond the maturing of your 401K. Crafted to age gracefully with heavy use, the 13" laptop / iPad Pro briefcase only gets better with age. This versatile business briefcase brings with it the aroma of craftsmanship and entrepreneurial spirit. 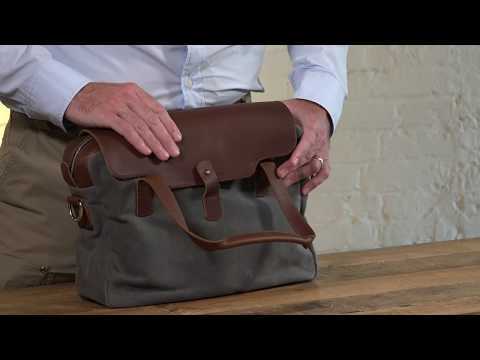 Whether you carry reams of paperwork, a 13" laptop, or an iPad Pro, this is your go to do-it-all everything business bag. It will accompany you down your road less traveled and carry all the tools you need to arrive there in one piece.